2011 August » Embroidery Talk Has Moved! Whenever we do a trade show, someone inevitably asks me what all the different threads we display are for. In our booth at the NNEP shows this year we had polyester machine embroidery thread, rayon machine embroidery thread, metallic thread, variegated thread, and merrow thread. About the only thing we didn’t showcase was our monofilament thread. Since I always seem to get asked this question at every show, I thought it might be a good idea to do a blog post which would talk a little bit about the different threads we sell and the purposes for which they might be used. Think of it as a guide to the threads of EnMart and hopefully a bit of help for you when you’re deciding which thread you need to buy. First up is polyester thread. This machine embroidery thread is available in 5500 yd king cones and 1100 yd mini king spools. 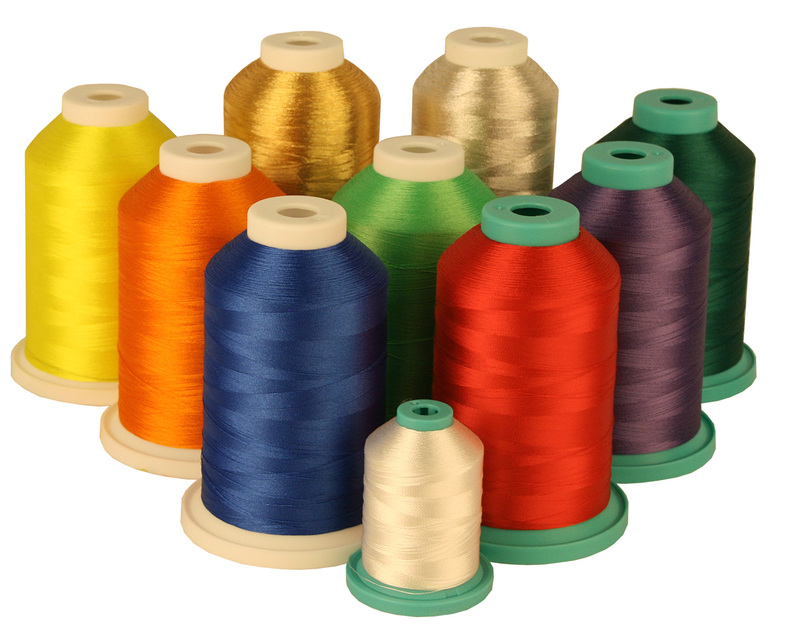 Iris UltraBrite polyester thread is durable, washfast and colorfast. It can be bleached. This it the thread our parent company uses to embroider emblems for industrial laundries. It’s tough stuff but, due to the trilobal polyester fibers used in the thread construction, it also has a shine that many polyester threads can’t match. Second, we have rayon thread. Rayon used to be the standard when it came to machine embroidery thread, and it still is for many people. Iris Smooth N’ Silky Rayon has a deep shine and rich color, which makes it an ideal thread for delicate embroidery. Rayon thread must be washed and handled carefully, and is not ideal for embroidery that might be exposed to a variety of conditions. Third we have metallic thread, which is available in both silver and gold as well as colored metallics. This thread is a terrific accent thread, and will add sparkle and shine to your designs. Unlike a lot of metallic threads, Iris Dazzling Metallics can be sewn at normal speeds and do not require a special needle. If you want to see how metallic thread can be used, check out this article from Stitches Magazine about 2012 trends. The embroidery was done by Black Duck Inc, but the metallic thread is from EnMart. Fourth on the list is polyester variegated thread. Although I love the shine of our Iris polyester thread, and the sparkle of our metallics, variegated thread may be my favorite. I love how all the colors mix together to form a harmonious whole on the spool. The thread also looks terrific when sewn out as an accent for a design. Our variegated thread is also great for quilting. Fifth is our merrow floss. This thread is used in a merrow machine and is what creates the colorful border around our blank patches. I’m often asked, mostly by people who are attracted by the color and shine of the thread, if merrow floss can be used in an ordinary embroidery machine. My answer is generally no. While I’ve heard people talk of trying it, I’ve never heard of anyone doing it and, in any case, merrow thread is designed to be run in a merrow machine. Finally, we come to our monofilament thread, which isn’t glamorous, but can be very useful. Monofilament thread is generally used in conjunction with merrow thread. This is a great thread when you want stitches or seams to be as invisible as possible. It can also be used when you want to add sequins or pearls or other decoration to a garment. 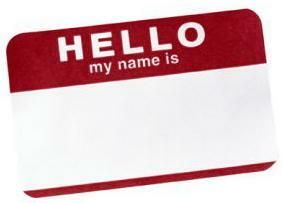 So, hi there – it’s been a while and I really feel like I should wear a name tag, so you all remember who I am. I know we’ve been a bit silent on this blog for the past month or so, but that can be one of the problems with having a corporate blog written by one person. I’ve missed talking to you all but the good news is that my schedule seems to be going back to more of a normal routine, so I should be able to blog here more frequently. To start off our more regular blogging schedule, I did want to do a little bit of catching up, since it has been a while, and we do have some good and fun things about which to talk. First I wanted to remind everyone that EnMart will be in booth 332 at ISS Atlanta and booth 812 at ISS Ft. Worth. These are your last two chances this year to visit an EnMart booth. If you need passes for or further information about either show, please contact us. We’ll be glad to help. Second, I wanted to say thank you to those who came to visit with us at the NNEP Shows in Houston and Nashville. We had a great time meeting new people, seeing old friends and spreading the word about EnMart. For those of you who don’t know, the National Network of Embroidery Professionals (NNEP) is a terrific organization that does great work in the world of embroidery and garment decoration. Arch, Susan and Jennifer know their stuff and they care about helping embroidery businesses learn and grow. If you’re not a member, I highly recommend you become one, whether you own an embroidery business or are a supplier to embroidery businesses. EnMart has been a supplier member for a couple of years now, and our NNEP membership is one of the best investments we’ve made. Third, I wanted to say thank you to all of those people who have been following us on Twitter and liking our page on Facebook. We appreciate your interest in our company and will do our best to keep our feeds and pages informative and interesting. I also should remind everyone that Facebook and Twitter are often the places where we first announce new things or spread the word about sales and specials, so if you aren’t already following us, you may be missing the most up to date news. Fourth, I wanted to address the issue of Iris embroidery floss, as we’ve been getting some questions about that lately. We do not carry embroidery floss or have anything to do with that market, but we can supply limited help. You can download this Iris floss to dmc conversion chart if you are currently using DMC floss but wish to convert to Iris. If you have further questions, it may be best to contact Hilos Iris directly. Finally, I wanted to let everyone know that we are looking at some interesting new products to add to our inventory, and I’m hoping we’ll have some announcements soon. If you have any suggestions for items we should consider or a product you’d like to see us add to our product line, please do share your thoughts. Obviously, we want to stock products that our customers want to buy, and the best way to do that is for you to tell us what you’d like us to have in stock. I’m glad to be back to blogging and I do intend to keep this blog updated on a much more regular schedule. Thank you to those of you who’ve hung in there while we’ve been silent. I promise we’ll be more entertaining from now on.